What's 9 years old and comes in a can? Here's a hint - think Weasel. Yup, you got it. Oskar Blues is celebrating 9 years of putting their craft beers in a can and starting the craft beer in a can revolution. And to celebrate they are hosting a CANiversary party and you're all invited. Read the details below from the folks at Oskar Blues in Longmont and Lyons, Colorado. 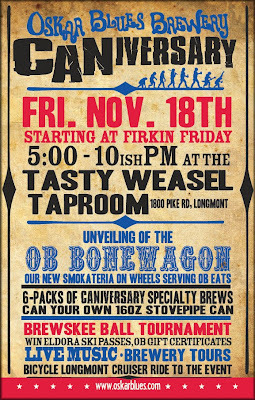 We’d like to personally invite you to join us in celebration of our 9th CANniversary, on November 18th, at the Tasty Weasel Taproom in Longmont, ColoRADo. 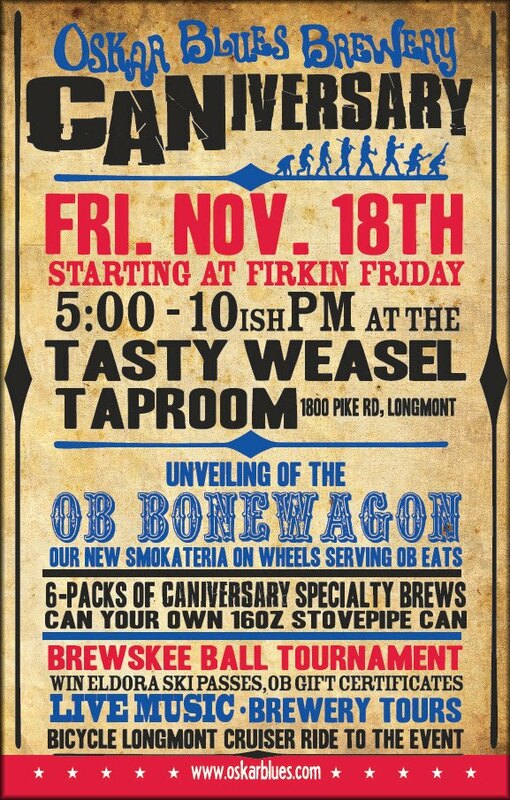 Festivities are kicking off at 5pm, with the tapping of our Friday firkin, Vanilla Bean Café au Chub, and will feature the unveiling of the Bonewagon, our new Barnstormin’ Smokateria on Wheels, where you can get some “Rubs” and “Tugs” such as Oskar Blues’ award-winning smoked wings, and a Hops & Heifers Farm Home Grown Burger, made with beef from our spent-grain-and-grass-fed cattle. You’ll have the chance to HAND CAN your own 16oz stovepipe of HGH Part DUH or another Oskar Blues specialty brew (to be released at the party!) using our original canner, with the purchase of a 6-pack of HGH Part DUH from the Tasty Weasel Taproom. Play in our BrewSkee Ball Tournament with a buddy for a chance to win two lift tickets to Eldora Ski Resort, a $50 gift card to our restaurants, or a $25 gift card to the Tasty Weasel. Catch a brewery tour, try some delicious Ten FIDY Chocolate Stout cake from Tee & Cakes, or a Bacon-Maple Chub cupcake from The Daily Cake, and jam out to live music performed by the Johnny O Band. Should you be feeling extra ambitious that night, join the Bicycle Longmont Cruiser Ride to the brewery from Dickens Tavern in downtown Longmont. Best lit-up bike wins a $25 gift card to the Oskar Blues restaurants! Riders are leaving the Tavern at 6pm. AND, if you’re feeling extra giving, bring in an old bike to donate to Bicycle Longmont’s Holiday Bike Program. 1 bike donated= 1 free PINT! We’re looking forward to celebrating nine year of putting four-dimensional beers in cans, and hope you can join us.